As per usual, Kim arrived first and I decided to take the parking spot in front of him. I backed up so close, he was beginning to show fear in his eyes. Little did he know my car has a backup cam! LOL. 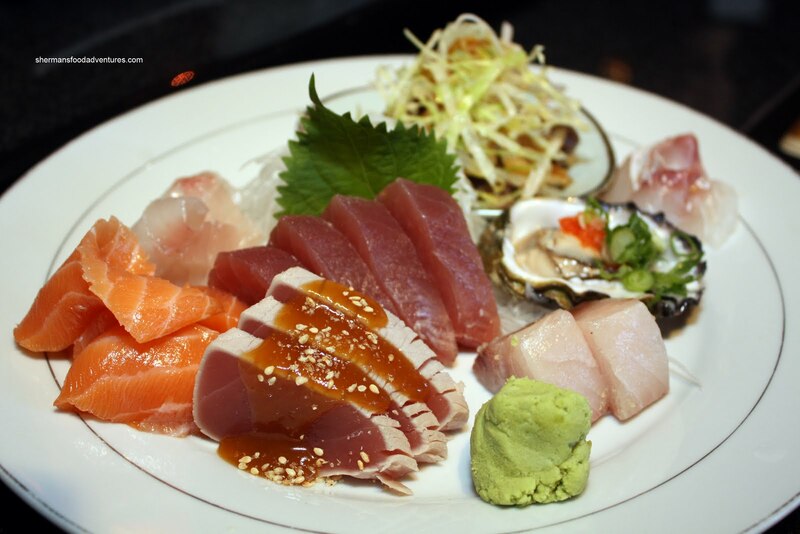 So after taking what seemed forever to order, we decided on a wide range of items to sample starting with the Sashimi Platter. Consisting of red tuna, salmon, snapper, oyster, hamachi, tuna tataki, and something that I thought was flounder, everything appeared and tasted fresh. Nothing amiss here and in fact, the platter was very well plated and expertly prepared. 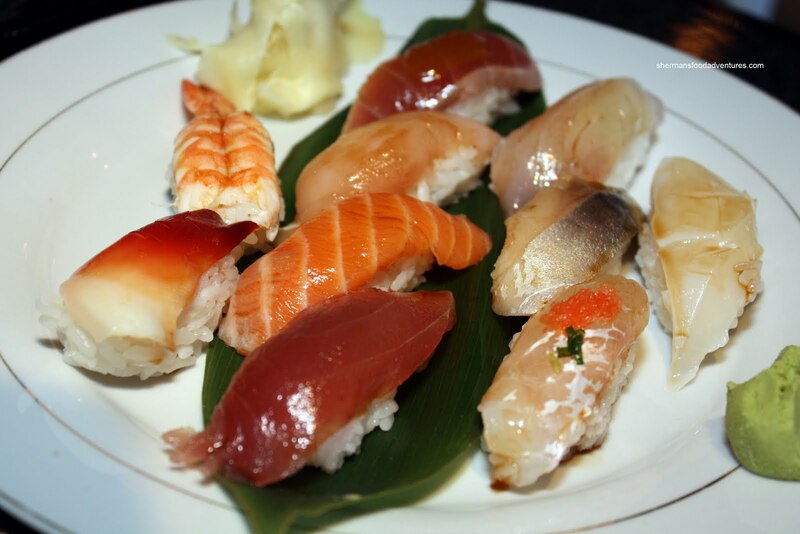 On a separate sheet, there was this special combo which include 11 pcs of nigiri, 4 pcs of maki, a mini udon and a side of groovy jazz sounds. We decided to get 2 of these combos to share. It then occurred to me that we double-ordered the groovy jazz sounds as well. Vandelay exclaimed we would be getting the jazz in stereo as a result. Cheeky... Now, according to the menu, the Nigiri consists of 1 piece each ebi, hamachi, salmon, tako, squid, hokkigai, mackerel, red tuna, albacore tuna, unagi and "something". Yes, it actually stated something on the menu. Well, there was a piece of fish we couldn't identify, maybe it was the something species of fish (I thought it maybe skipjack). Strange, but as you can clearly see, there was no tako present. As for the nigiri in general, the fish was quite good and tasted good on its own due to being brushed with sauce. The much talked about Haenuki rice used here was pretty good. However, for me, it seemed to lack some flavour. The 4 pcs of maki turned out to be the standard California Roll. I really liked the toasted sesame seeds on the outside. Nice nutty flavour. 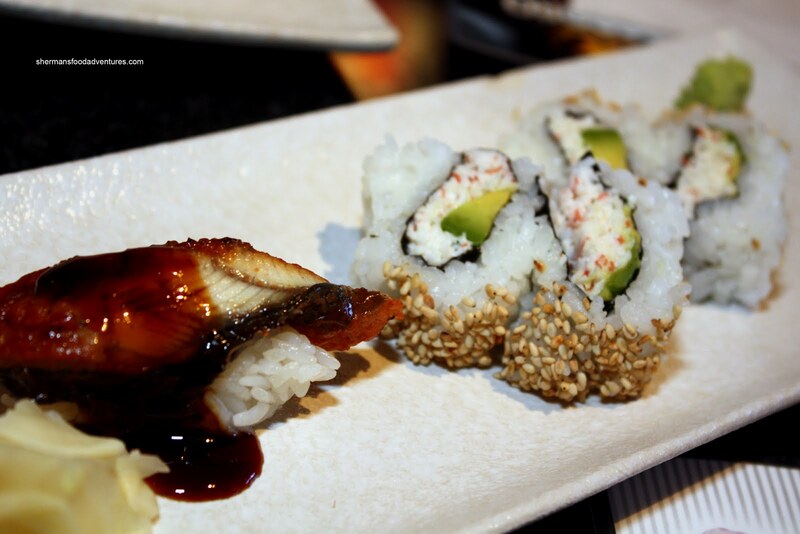 For some reason or another, the rice did not fare as well here compared to the nigiri. No idea, but it seemed almost gummy. Maybe too much rice to filling ratio? As for the Mini-Udon, guess who ate it? Yes, my son loved it and practically finished it all. I liked how there was a nice plump clam nestled within the broth. I didn't like the soggy tempura bits though. That has never been really appealing to me. 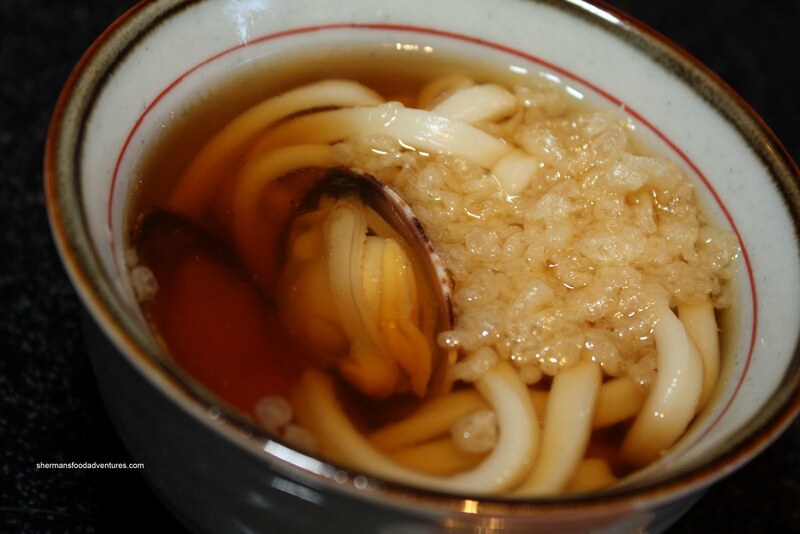 As for the udon noodles, they were still chewy (which is good). The broth was quite tasty having depth. 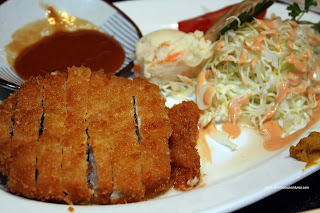 To get a sense of the menu, we went for non-sushi items starting with the Fried Pork Cutlet. The large and meaty cutlet was fried perfectly crisp without being oily. However, the meat was a little on the drier side. I wasn't sure what the accompanying sauce consisted of; but it wa s sweeter than the standard tonkatsu sauce. Strangely enough, my favourite part of this dish had to be the mashed potato salad. Moving on to another classic Japanese fusion dish was the Beef Curry Rice. Typically, Japanese curry is very sweet and very yellow. The version here was neither. 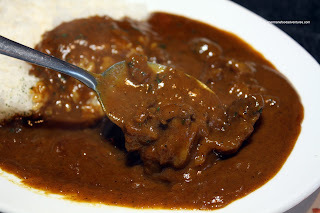 First, it looked a lot closer to actual Indian curry than Japanese curry. Second, it was actually spicy, which gave the sauce a whole lot of depth and body. I personally liked this curry quite a bit. 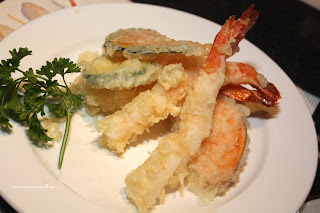 We then moved onto a very standard dish - Assorted Tempura. We mainly ordered this for the kiddies. My daughter loves the prawn tempura and usually eats the thing whole (good girl!). But my son only eats the tempura batter (WTF?). Well, too bad for him, because the batter was not all that crispy. This resulted in a soggy tempura which was not to my liking and especially to my son's disappointment. Last dish was the Zaru Soba, which was ordered for Vandelay's son. Accompanied by a cute quail's egg were the usual condiments (grated daikon, ginger, scallions, wasabi & tsuyu). The soba nooodles had a nice al dente texture, otherwise, it was a pretty typical zaru soba. 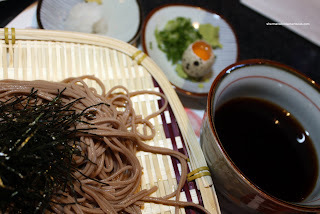 It's nice that they served it in a basket since that is the "zaru" in zaru soba. Most other places serve it on plates, so they really should call it "Ceramic Soba". I digress. To be honest, I wasn't really sure what to think of this meal. It was typical and non-typical, all at the same time. Some of the twists were very subtle, so at first glance, it just seems like any other Japanese restaurant. But it's not. The food was pleasant enough and the prices were quite reasonable for what we got. It's different enough to separate itself from the multitude of generic Japanese restaurants that plague our city. There is something really freaky about your post are mine... They are extremely similar!!! But, then again, we were seated on the same table so that explain things, hehehehe. Again, thanks for checking on me for this one! I often love going to places that you visited, but several weeks...or sometimes, months later! Again, your description of Kimura is quite accurate. Nothing has changed in the meantime. Summer menu is still the same. "Something" still appears on the menu. Also jazz music is the same. The only new addition is kobe beef. 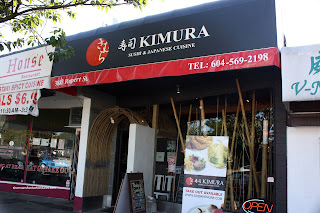 Overall, I thought Kimura was "meh". Rice didn't impress. Tempura was still the same -- i.e. not that crispy. Given the fact that I don't go to too many restaurants, I'll leave this in the category of "tried, but unlikely to go back."